Video of a woman demanding a "white doctor" for her son at a walk-in clinic in Mississauga, Ont. has gone viral, sparking outrage across the country. 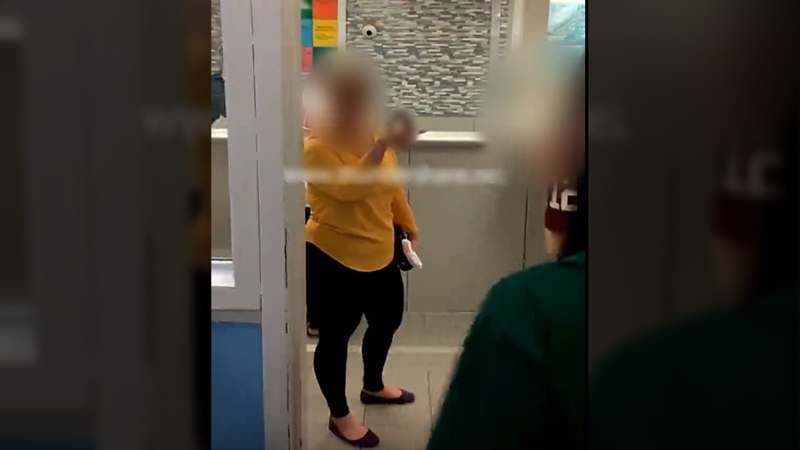 The video, which was recorded by a witness and posted online, shows the woman repeatedly demanding to see a white doctor in a four-minute argument with staff and patients at the clinic. "I would like to see a white doctor," the woman says at the beginning of the video, to a member of the clinic staff in the waiting room. Her son, who appears to be approximately eight years old, can be seen sitting quietly beside her. "You're telling me there's not one white doctor in this whole entire building?" she says. The clinic staffer can be heard explaining that a white pediatrician will be in at 4 p.m., but this does not appear to satisfy the woman. She continues to complain, claiming that she waited five-and-a-half hours to see a "brown doctor" whom she says did not help her child with his chest pains. "He was not speaking English. His teeth were brown. I do not need his help," she says in the video. The woman's complaints quickly draw the attention of others in the waiting room who accuse her of being racist. Several also suggest she take her child to a hospital, but she refuses, answering the suggestions with a racist slur. The woman becomes more agitated as the four-minute video progresses, eventually approaching the desk to repeat her demands for a white doctor. "Oh my God, what type of horrible country do I live in?" she says in the video. "Being a white person in this country, I should just shoot myself." Later in the video, she appears to back off her requirement that the doctor be white, and instead asks for one who was born in Canada. "My kid is part not-white, so can we get somebody to see him that at least speaks English?" she says. "I spoken (sic) English. We want somebody Canadian to see him." 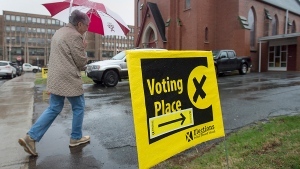 Ontario Premier Kathleen Wynne said she was shocked and disgusted by the incident. “I think it is a shocking occurrence and there is no place for that kind of behaviour or that kind of racism and hatred in our society. I think we should all be shocked,” she said. Hitesh Bhardwaj, who recorded the video in the waiting room, says the incident also shocked him. "Seeing it so openly, without any fear, in front of so many people, without even fearing that someone can report her – it was really shocking," he told CTV Toronto. Bhardwaj, who immigrated to Canada from India five years ago, says he had "no doubt" that what happened at the clinic was wrong. He added that the incident troubled him "for the rest of the day." "It was a mixed feeling of being angry and being frustrated," he said. He can be heard arguing with the angry mother toward the end of the video, telling her that a doctor doesn't need to be white to speak English. A young woman also confronts the mother at an earlier point in the video. "Your child clearly has more issues with you being his mother than him needing to see a doctor," the young woman says. "You are extremely rude and racist." Bhardwaj hailed the young woman for her courage in intervening. "There was a very brave young girl who came right up to her face and said that you are racist and you shouldn't be doing those things," he said. The encounter ended without further incident, and the woman was escorted out of the waiting room. Peel police say they were called to the clinic Sunday afternoon for a "disturbance." Const. Mark Fischer said the caller reported a woman who was "being verbally aggressive" and demanding a "white doctor." "The officer found that no criminal offence has been committed or was in the process of being committed," Fischer told CTV Toronto. A doctor at the clinic eventually treated the boy, police said. Bhardwaj's video of the encounter has been viewed more than 20,000 times online since Sunday, when he says the incident occurred. This isn’t the first time the woman has had a racist outburst, according to some of her former friends. Two women who were friends with her until a few months ago told CTV Toronto that they recognized who was in the video right away. “It was because of her racial slurs, she was saying a lot of racial things. I have three sons, they’re all black and I didn’t want to have that negative person around my kids,” said one former friend. Neighbours also told CTV Toronto that there have been several altercations with this woman. They said they called the police after she allegedly yelled racist slurs at children. “She was calling my three and five-year-old brothers the ‘N’ word,” said a neighbour. Peel Police confirmed that they responded to a neighbour dispute last summer, but no charges were laid. Now that the video has gone viral, the woman’s former friends hope she learns her lesson. “I hope she second guesses ever doing that in public again. If you have those feelings leave them at your door, at home, when you leave,” a friend said. The woman didn’t respond when asked for comment.